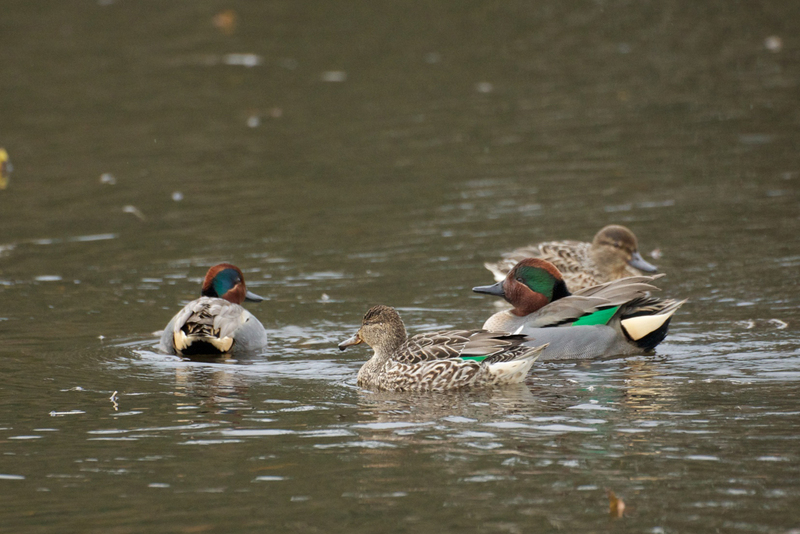 Take a walk around a lake in late November, and you'll find male ducks in their most brilliant breeding colors. These ducks have lost their nondescript late-summer feathers, known as "eclipse plumage." 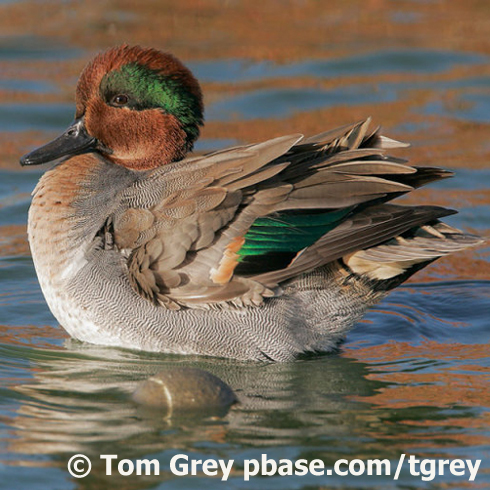 Male dabbling ducks - like this Green-winged Teal - look their finest in late fall and winter, the season of courtship and pair-bonding. The 2019 BirdNote calendar features many beautiful birds. Check it out! Take a walk around any local pond or lake in late November, and you’ll find ducks in their most brilliant breeding colors. The male or drake Mallards [Mallards] sparkle their greenest on their heads and necks, and their bills are now golden yellow. 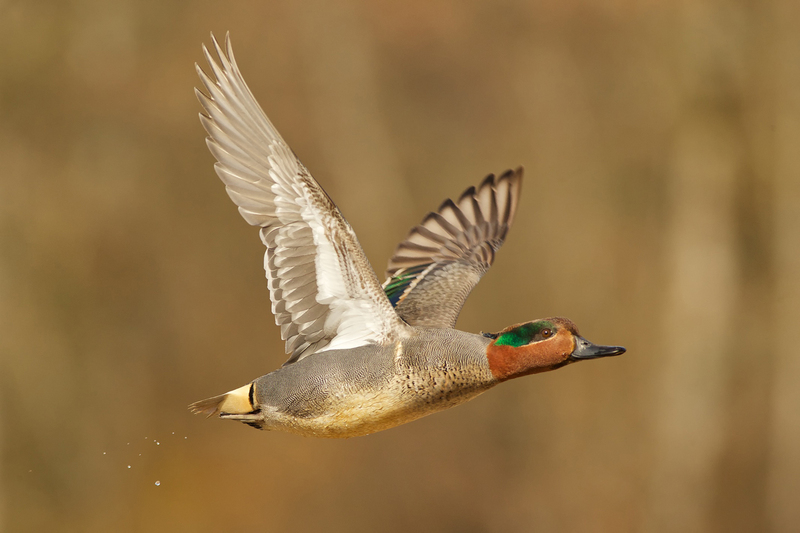 Green-winged Teal males are at full luster [Green-winged Teal], every detail of their complex plumage precisely delineated. Male Northern Shovelers [Northern Shovelers] have regained their deep emerald head-feathers and rich brown flanks. After months of molting out of their nondescript late-summer feathers, known as “eclipse plumage,” male dabbling ducks look their finest in late fall and winter... [Mallards and Green-winged Teal, calling and quacking] …because for most ducks, this is the season of courtship and pair-bonding. Males display and chase females and fend off other males, to win a mate with whom they’ll migrate in spring to their nesting grounds. That’s a schedule quite different from the usual timetable of songbirds, which sing and court and find mates in the spring, after migrating to a nesting area. ‘Tis the season for duck-watching, when the showiest perform at the top of their art. You’ll find four seasons’ worth of birds in the latest “Birds of BirdNote” calendar. It’s available at our website, BirdNote.org. I’m Michael Stein. Calls of the ducks provided by The Macaulay Library of Natural Sounds at the Cornell Lab of Ornithology, Ithaca, New York. Mallard recorded by A.A. Allen, Northern Shoveler and Green-winged Teal recorded by W.W.H. Gunn. Buy a duck stamp - and help save habitat for ducks!